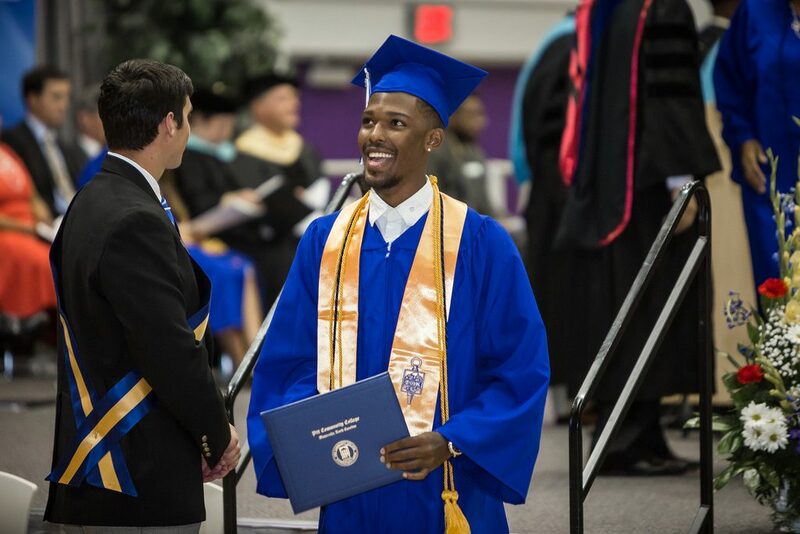 The 2019 Pitt Community College Commencement Ceremony will be held Wednesday, May 8, 2019 at the Williams Arena (Minges Coliseum, ECU) at 7:00 p.m. for all graduates. Students will need to apply for graduation through their MyPittCC Portal. Students can find additional information about the commencement ceremony on the Graduation Page in their MyPittCC Portal. This will include information about the graduation fair, cap and gown, degrees and diplomas, honor cords, graduation photos and more. Parking is available in all lots surrounding the Athletics Complex at Williams Arena. Each guest, including children and infants, who attends the commencement ceremony will be required to have a ticket. Graduates will receive tickets for the ceremony at cap and gown pick-up on April 8-10, 2019. The 2019 Transitional Studies Graduation Ceremony will be held Thursday, May 9, 2019 at the Greenville Convention Center at 7:00 p.m. This ceremony will include graduates from High School Equivalency, Adult High School, and Career Academy. The 2018 Pitt Community College Spring Commencement was held at the Williams Arena (Minges Coliseum, ECU) on Tuesday, May 8, 2018 at 7:00 p.m. Visit PCC’s Flickr website for photos of the event. The 2018 PCC Graduation event was rebroadcast on PittTV Suddenlink Communications Cable (Channel 13) at 10 a.m. and 4 p.m. every Sunday from the event through the month of September. Schedule adjustments may have occurred. Please direct questions regarding the commencement ceremony to Amelia Martin at 252-493-7480 or acmartin823@my.pittcc.edu.